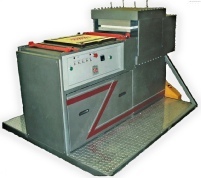 The custom pouch forming machine makes custom shaped bags and pouches with a platen style heat sealer to form a custom shaped pouch, then heat seals material together. It then die cuts the outline of the custom shaped bag. It makes specialty pouches from laminated films, laminated foils. The hydraulic die cutter designed to meet low to moderate production requirements. Hydraulic die cutting provides even cutting pressure which can extend steel rule die life tenfold. It is completely self-contained, and requires electrical supply only. Materials are placed on the striker plate the steel rule descends, slides the assembly into the press, depresses the two-hand start buttons to initiate the automatic cutting cycle. An adjustable timer controls the trim time and adjustable pressure control Heat seal system/heated striker plate; allows blister sealing and die cutting at trim station.